Photograph, High Frequency Directional Finding Station. 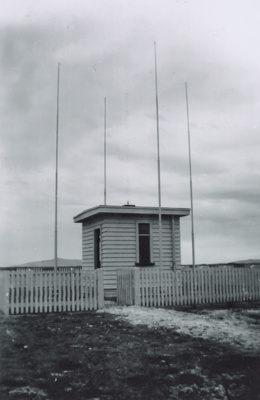 This photograph is of the High Frequency Directional Finding Station at Awarua. During World War Two, this station monitored New Zealand waters for any enemy vessels. When one was detected, the Awarua Station liaisoned with Wellington, Auckland and sometime Sydney to triangulate the location of the unwelcome vessel and provide a location for aircraft to target. During the war, the Station was so important that it was protect by armed guards at all times. In black pen along the top right edge of the photograph: '2671-037'.